(TibetanReview.net, Sep03, 2016) – Secret trials and imprisonments appear to continue to be the norm in Chinese ruled Tibet even after much publicized supposed reforms in China’s criminal justice system. In a latest known instance, a Tibetan monk who disappeared after being taken away by Chinese police for staging a lone street protest in Ngaba (Chinese: Aba) County of Sichuan Province almost a year ago has turned out to be serving a three-year jail sentence. 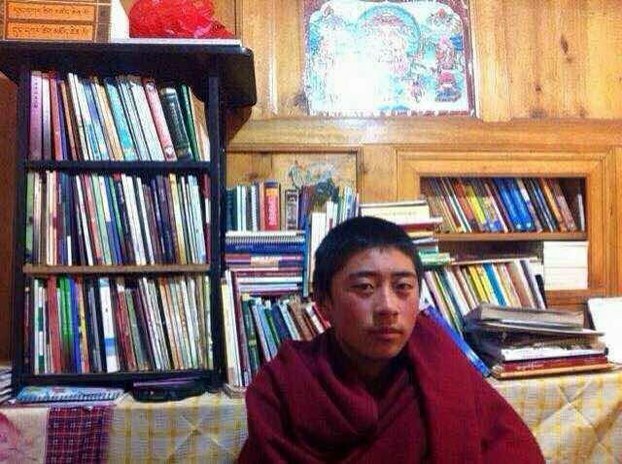 After months of quest for information, the monk, Lobsang Kelsang, then 19 years old, was found out by his family to be held in Deyang prison in Huang Xu town of Deyang City, Sichuan Province. He was earlier detained in a prison in Maowun [Mao] County where he was sentenced in a secret trial to three years in prison and moved to Deyang, the Tibetan Service of Radio Free Asia (Washington) Sep 1 cited a local source as saying, speaking on condition of anonymity. The family has not been able to see him, so they do not know his condition, the report added. The monk had carried out his protest at around 3:00 pm on Sep 7, 2015 on a central street of the main town of Ngaba County. He carried a photo of Tibet’s exiled spiritual leader, the Dalai Lama, over his head while calling out for freedom for Tibetan people. He was quickly set upon and taken away by Chinese police. The report cited a local source as saying that a Tibetan layman who attempted to interfere with the arrest was also detained, and police at one point fired into the air to disperse a forming crowd. Lobsang Kelsang of Ngaba’s Meruma Township was a monk of the local Kirti Monastery at the time of his disappearance. Earlier, Adag (full name Lobsang Dagpa), another monk of Kirti Monastery, was also found last month to be serving a three-year jail sentence in neighbouring Lungu (Wenchuan) County. He too had disappeared following arrest by Chinese police after he carried out a lone street protest in the same Ngaba town area on Sep 10 last year. His family too was not allowed to see him after having located him through months of efforts.